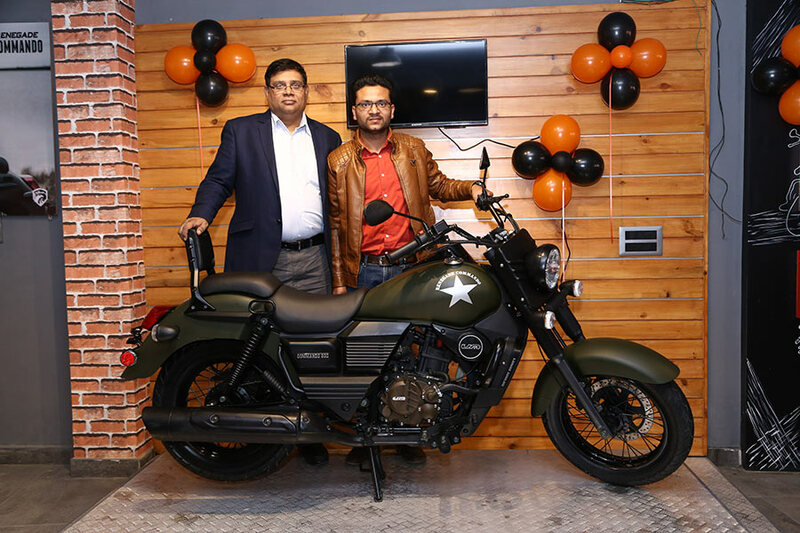 UM Motorcycles — the Indian arm of the American motorcycle maker UM International, LLC — along with Lohia Auto today made its entry in the hilly city of Dehradun as it inaugurated its dealership in the capital of Uttarakhand. The dealership, located at GMS Road, opposite Chaudhary Farm House was inaugurated by Mr. Sunil Singh, Senior Vice President – UM Lohia Two Wheelers Pvt. Ltd, in the presence of Mr. Ankit Agarwal, Proprietor, UM Dehradun and other dignitaries and guests. The state of the art dealership will be spread over a total of 2500 sq. ft.; which shall include an area of 1500 sq. ft. for interacting with customers, and an area of 1000sq. ft. to provide the best after sales service and support. Customers will also have the luxury of buying all UM branded accessories from this dealership as well. The company further shared that the recently announced 24×7 Roadside Assistance Programme (RSA) will also be available for all customers of the city immediately. As Dehradun is swiftly moving towards being a “mini-metropolitan” city which has resulted in a vast number of young entrepreneurs setting base here, it was imperative that we commence our operations in the city as well. This part of the country has excellent highways besides lakes and rivers through forests and hills, making it an ideal playground for cruiser motorcycles. We are confident that we shall get a good response from motorcycle enthusiasts in Dehradun and surrounding areas. Our unique form of motorcycling is centered around the idea of a perfect connect between the rider, his bike and the terrain he rides through. We call this Pure Motorcycling. We have been working very hard to create motorcycles that engage deeply and are a pleasure to ride in real world riding conditions and speed. With a perfect combination of aesthetics, dynamism and perfect road handling, our UM products provide a truly unmatched biking experience. This dealership will house our flagship products Renegade Commando and Renegade Sports S.
It’s indeed an honour for us to be a partner with UM Motorcycles, the world-renowned motorcycle manufacturer. Dehradun has a rich motorcycling culture and after riding the Renegade Commando and the Renegade Sports S, I am sure that all bikers who prefer cruisers will opt for our products without a single thought. As representatives of UM Motorcycles, we shall ensure all customers are pampered with the luxurious UM experience. The level of interest in the UM brand in Dehradun has been very positive. Our investment in the showroom and workshop has already been rewarded by confirming orders which we have received prior to the inauguration. The Renegade Commando is a low-slung cruiser powered by a high-powered 280 cc engine with 25 BHP at 8,500 rpm and 21.8 Nm of torque at 7,000 rpm, mated to a six-speed transmission. This lightweight machine has a 200mm ground clearance and an inbuilt USB charging point. The front disc brakes improve the braking efficiency drastically while radiation increases the engine efficiency. The bike comes with wide handlebars and hydraulic telescopic front suspension and spring rear suspension, which is ideal for a cruiser-segment motorcycle. The Renegade Commando will be available at INR 1.68Lakhs (ex-showroom, Dehradun). The Renegade Sports S model also shares the same engine as the Renegade Commando. The Renegade Sports S was much appreciated when it was showcased at the 2015 EICMA in Milan. The Renegade Commando and its sibling Renegade Sports S come with an electric start. An innovative feature called Service Alert Maintenance comes as a standard fitment in both Renegade Commando and Renegade Sports S. The LED Lights come as a standard in Sports S version. Six-speed synchronized mesh has been added for easy cruising. The front wheel has telescopic suspension while the rear wheel has dual shock absorbers. These motorcycles have a fuel tank of 18 liters with a kerb weight of 172 Kg. The Renegade Sports S is available at INR 1.62 lakhs (ex-showroom, Dehradun).